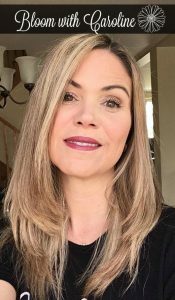 Valentine’s Day is approaching and we all want to make a delicious and special meal for our family and loved ones, but with our busy lives, we need something easy that doesn’t take a day to prepare. That’s why I prepared this Easy Valentine’s Day 3 Course Meal. With this menu, your family will definitely know how much you love them., and will be thankful for a delightful dinner. 1- Mix together the ingredients for the vinaigrette and reserve in the fridge. 2- Remove the duck meat from the bone and pull the meat apart. Reserve. 3- Place mixed greens in 4 bowls. 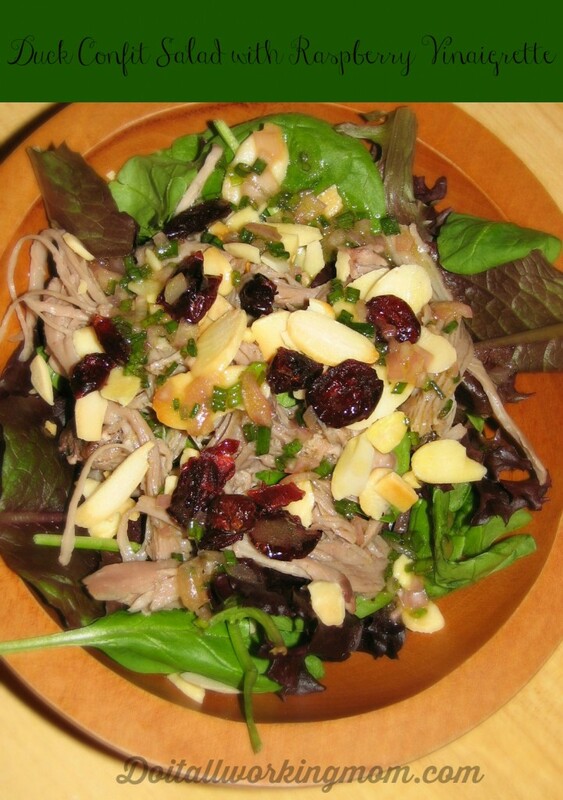 Top with duck meat, almonds, cranberries and vinaigrette to taste. 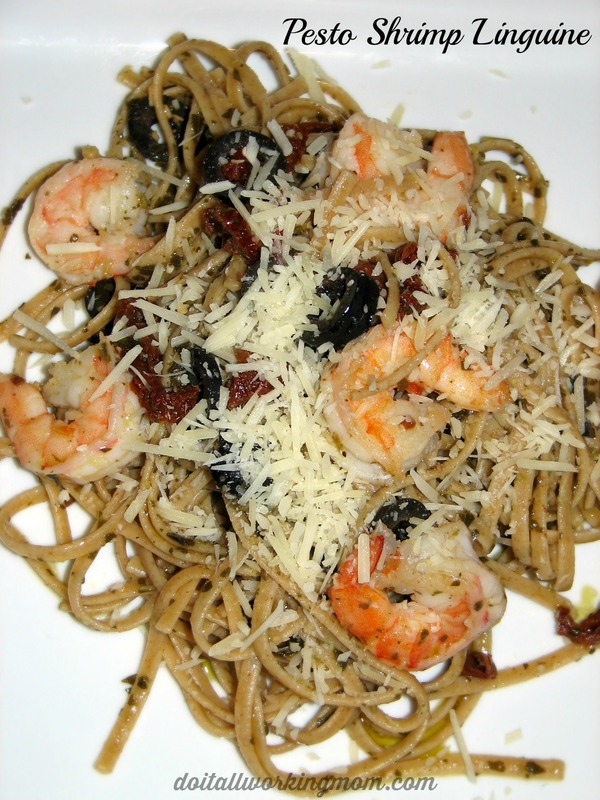 Put cooked pasta in a pot, add the olive oil, pesto, cooked shrimps, olives and dried tomatoes. Mix well and heat for about 5 minutes at low heat. Place pasta in serving plates and top with grated parmesan cheese. 1 container of cream cheese 250 g.
3- With a mixer, mix together the cream cheese, lemon juice and vanilla extract. Add the icing sugar and mix well. Add the whipped cream and mix until blended. Poor over crust. 4- Place in freezer for 1 hour and then in the fridge for 2 hours. Delicately remove from muffin pan. 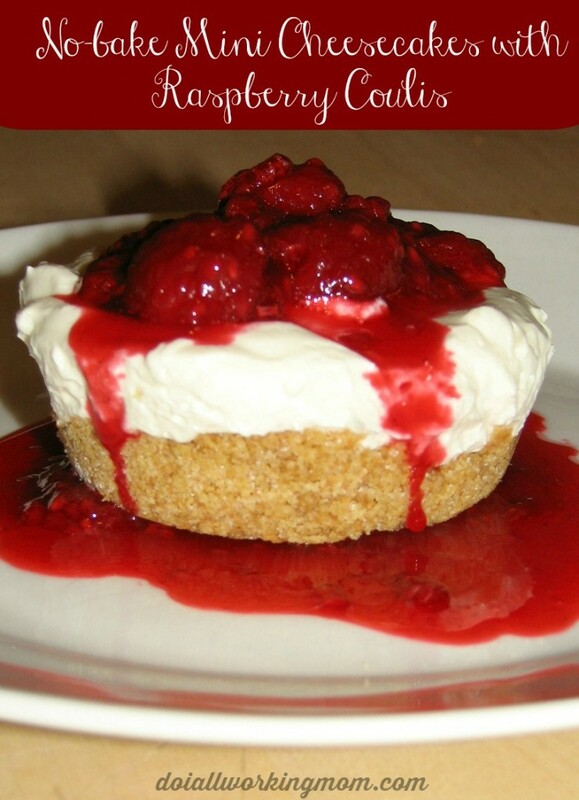 5- Top with Raspberry Coulis. If you have left over mini cheesecakes, you can keep them in the fridge in an air tight container. 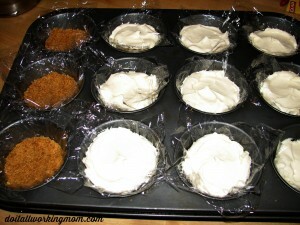 1- With a spoon, mix together all the ingredients and reserve in the fridge until ready to serve over mini-cheesecakes. I hope you and your family enjoy this delicious meal. That shrimp recipe looks fantastic (and easy). Going to have to try that out myself! It’s delicious and your right really easy to make. I would probably use chicken instead of duck but other then that–I am sitting here drooling!! My pleasure, my family really enjoyed it! That dessert looks divine! I’m coming to your house for V-day! Wow! I think my husband would really enjoy this, especially, the cheesecake. My husband and kids sure did! 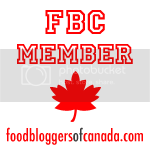 Your right, dried cranberries are delicious! Delicious! Sounds like the perfect valentine’s dinner to me. . .especially the dessert! The dessert is to die for!!! Sorry Emily your right… I corrected it. There is just icing sugar in the recipe. Thanks for making me notice.